In homes with forced-air heating and cooling systems, ducts are used to distribute conditioned air throughout the house. In a typical house, however, about 20 percent of the air that moves through the duct system is lost due to leaks, holes, and poorly connected ducts. The result is higher utility bills and difficulty keeping the house comfortable, no matter how the thermostat is set. 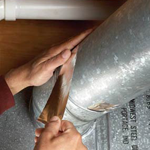 A duct system that is well-designed and properly sealed can make your home more comfortable, energy efficient, and safer. Contact us for a quote to seal the ducts in your home and improve the performance of your heating and cooling systems. Excessive dust in a home (2-3 days after dusting) is almost always caused by air conditioner ducting or sealing failures. As your cooling-heating system runs it pulls conditioned air to the furnace/air handler and either heats or cools the air depending on the season. After conditioning, the air is supplied back into the conditioned space. When there are breaches in ducting or air leaks at connection points, the conditioned space becomes depressurized. So, when the air is taken out of the conditioned space and not put back into the conditioned space there is less air in the home. The makeup air comes from any crack or crevice inside the home thereby pulling any airborne particulate along with it into your conditioned space. Common leakage points are attic access in conditioned spaces, recessed or standard lighting fixtures in the ceiling, outer wall power outlets, chimneys with open dampers, bathroom and dryer vents without check valves, windows and doors. Additionally, a breach or seal failure on a return duct (after a ceiling return air filter) can pull unfiltered air from the attic into the heating and cooling system. This unfiltered air reduces efficiency, contaminates air quality inside the conditioned space and increases wear on the mechanical system. 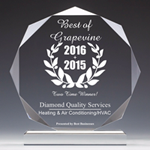 Choose Diamond Quality Services whether it is duct sealing, correction or duct replacement. We will provide you a thorough inspection and photo documentation with a clear explanation of services recommended prior to any work being done in your home.